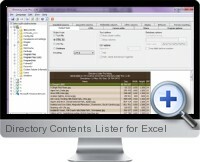 The Excel Directory Contents Lister (Directory Lister Pro) provides the ability to extract information from directory folders and subfolders and list for exporting to CSV for Excel, text or HTML. Directory content listing includes file names as well as attached metadata available for each file type such as dates and media attributes. Advanced options for analyzing directory contents and formatting listed results enable the solution to be adapted to range of specific and required scenarios. Recursively finds all files and sub-directories with the specified parent directory. Optionally extract and list file attributes including author details and media properties. Export directory contents listing to plain text, rich formatted HTML or CSV. Hash sum references are generated for each file to check for modifications. Extensive export style options for output tables include alternate row color, header and table style setting as well as clickable content for HTML. Define output column order, column sorting, filtering thresholds and date formatting options. Supports command line execution for automated directory content listing and reporting tasks.